May | 2015 | Why Is The Internet Broken? 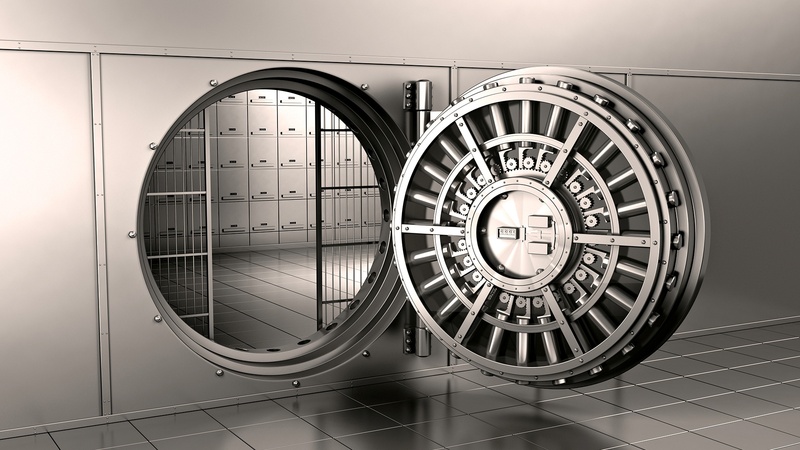 TECH::New Security Technical Reports out for Clustered Data ONTAP, PCI-DSS! This technical report provides guidance and information that auditors and system operators will find useful in applying the Payment Card Industry (PCI) Data Security Standard (DSS) requirements to a storage system that runs the clustered Data ONTAP operating system. This document provides a set of practical recommendations to enhance the security of a clustered Data ONTAP system. Note that the protection of user data itself is primarily the responsibility of the appropriate SAN and NAS protocols and configurations. These are secure by default and need little configuration and provide data confidentiality. Therefore, this document focuses on securing the system itself by focusing on administrative interfaces and services. It is intended to reinforce the integrity and availability of a clustered Data ONTAP system in a typical data center environment. Data protection has been a sore spot for IT organizations for decades, sometimes ignored or neglected until absolutely necessary. Of course, by then, it’s too late. Let’s take a look at how mankind has done their backups and archives throughout the years…. NOTE: I am not a historian and have played very fast and loose with the facts here. For a more serious take on backup history, check this site out. 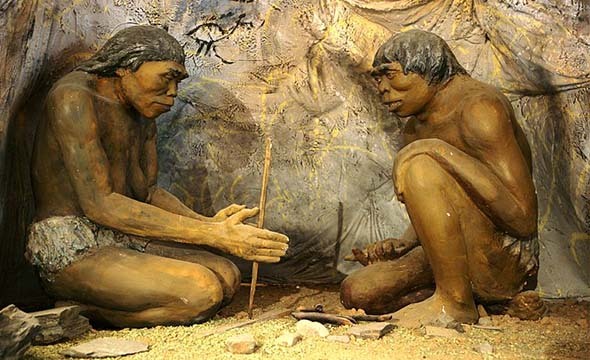 The early caveman would document history on the walls of caves, using various natural pigments, charcoal and torches. Naturally, this backup strategy did not have the advantage of being very agile and was susceptible to the elements. However, they have shown to be remarkably resilient, with some backups lasting 28,000 years! 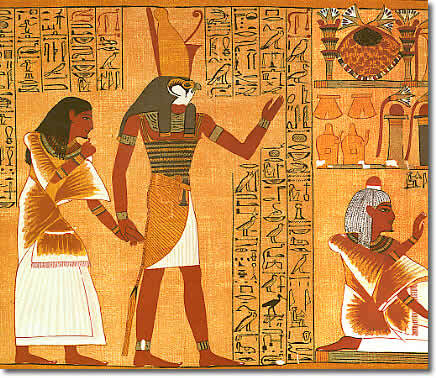 The ancient Egyptians used a similar form of backup with hieroglyphs. The cavemen proved it could be effective. Why mess with a good thing? 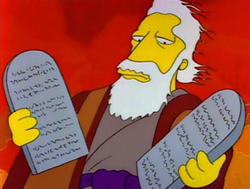 In theory, stone tablets were a significant upgrade for backups to cave walls. They were smaller and lighter, so you could move them to a safe location for better disaster recovery. But they were still pretty heavy. What if you dropped one? 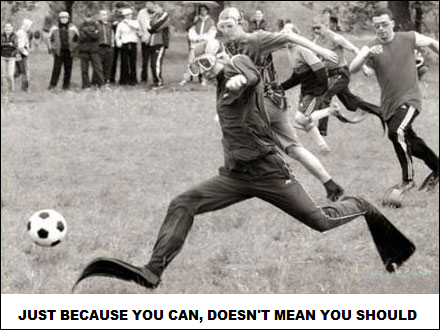 Or worse, what if you dropped one on your foot? Mankind had had enough of the limitations of writing on stone walls and tablets. It was time for a new medium. 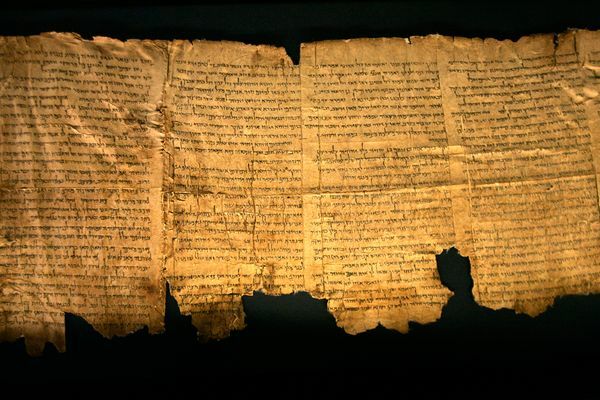 With the invention of papyrus in Egypt, people no longer had to backup to cave walls or stone tablets – neither of which were mobile or provided adequate disaster recovery. However, papyrus proved to be a fragile – and costly – backup medium. Parchment, made from sheepskin, proved to be a more durable backup medium, but also was costly. Eventually, wood pulp paper was invented. This made writing a cost-effective backup strategy, albeit not terribly efficient. 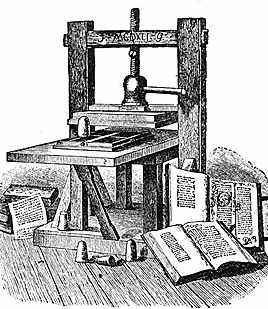 Johannes Gutenberg, likely driven by his desire to rid the world of hand cramps and need for backups in a world of ever-increasing data* (no citation needed… I made that up), invented the printing press. The printing press made cheap, fast and easy backups of large amounts of data possible. It’s first real test? 180 copies of the Gutenberg Bible. Over the years, the printing press evolved into a much larger entity, running thousands of copies of newspapers a day and archiving the world’s most historic events accurately and efficiently. With the growing need for enterprises to back up important files on-site, Chester Carlson set out to try to develop his idea for electrophotographic copies of paper. He was turned down by over 20 companies, including IBM and GE. In 1944, 5 years after he started, a nonprofit called Battelle Memorial Institute finally listened. 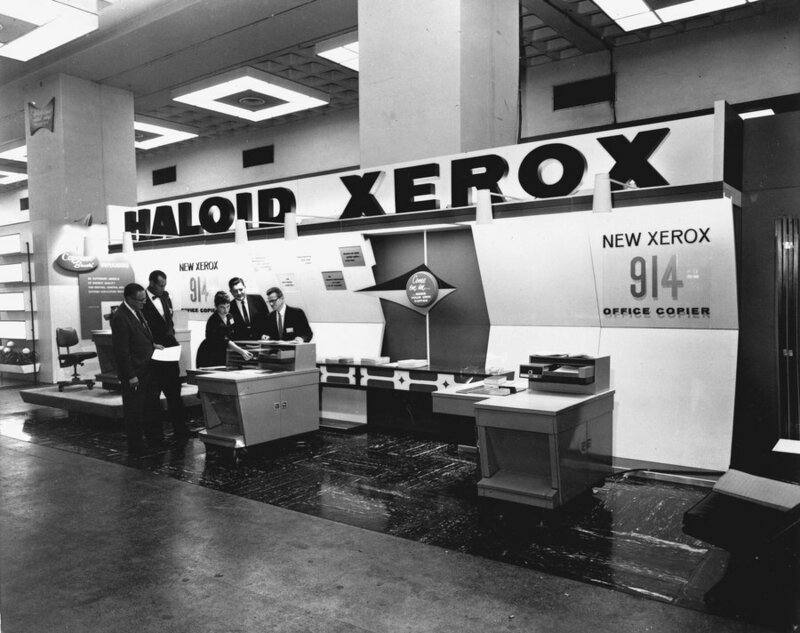 In 1947, a company called Haloid helped Carlson refine the process and renamed it “xerography.” In 1949, the first Xerox copier was introduced. Now, the enterprise IT admin could make copies of anything – important files, signatures, buttocks. The sky was the limit. 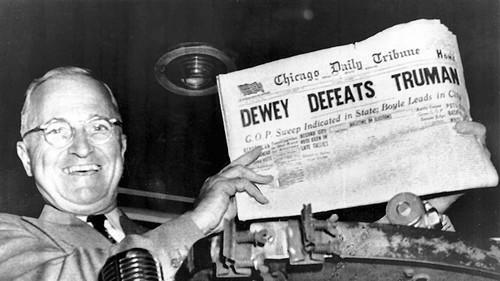 But while paper was relatively inexpensive, it was also not durable. Plus, a new challenge was surfacing – how to back up the digital data stored on computers. The first computers,(such as ENIAC, UNIVAC), were monolithic devices that took up entire rooms and were operated by a series of punch cards. These cards contained computer programs that could store data on a larger scale than normal pen and paper. However, by modern data standards, they didn’t hold much. This Gizmodo article postulates how many punch cards you’d need to store 15 exabytes of data. The answer? Let’s assume Google has a storage capacity of 15 exabytes, or 15,000,000,000,000,000,000 bytes. A punch card can hold about 80 characters, and a box of cards holds 2000 cards. 15 exabytes of punch cards would be enough to cover my home region, New England, to a depth of about 4.5 kilometers. That’s three times deeper than the ice sheets that covered the region during the last advance of the glaciers. With magnetic tape, we’re now entering the realm that most modern IT admins are familiar with. However, did you know that tape has existed for over 200 years in various fields? And that they actually were around when punch cards were used, but were so terrible, punch cards were preferred? Over the years, that’s changed. Tape quality, capacity and performance has increased magnitudes to where we can feel safe storing our enterprise data on them…. and then trucking them off somewhere else. That was problematic in and of itself – not only did you have to back things up to tape, you had to pay a company to cart them off to a secure location – and trust your data with a 3rd party. 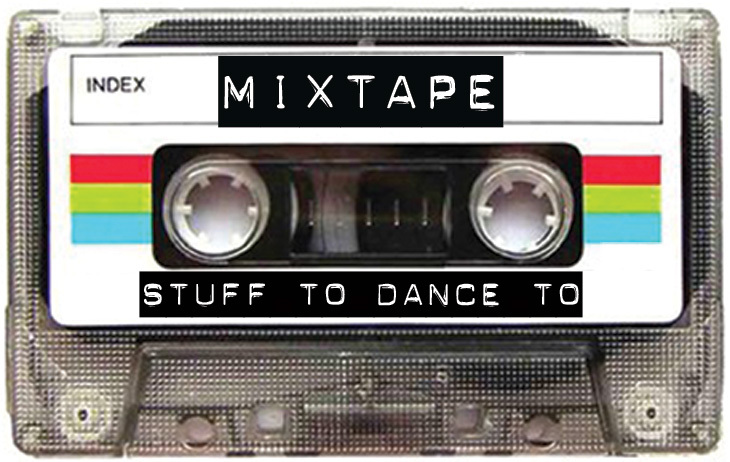 And if you grew up during the time of mixed tapes, you remember wearing them out until they were unlistenable. (Or at least recall accidentally pulling the tape out and having to re-wind it with a pencil. So, with tape, capacity and mobility was there, but durability and speed were still not bringing ease to companies that needed to keep data around a while. Storage operating systems, like NetApp’s Data ONTAP, also provide backup to disk capability via snapshot, as well as backup over a WAN using SnapMirror. I cover this in my Snapshots & Polaroid blog on DataCenterDude. Today’s push for backup is now towards the cloud. 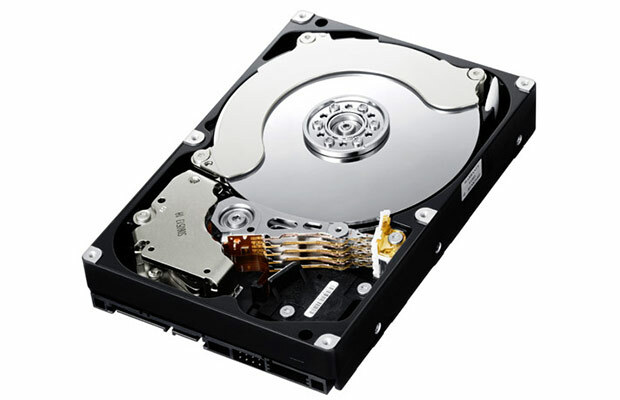 Disks, while cheaper than ever, still cost money. And if you’re going to back up over the WAN, why not do it to a cloud provider with dirt cheap storage that only gets cheaper the less often you access your data? Sure, you don’t own the disk, but you also don’t own the SLAs or maintenance – someone else does. Someone else has to hire the storage admins to manage the backups and archives you only use when you need them. This is where NetApp’s AltaVault (borne out of Riverbed Steelstore) comes in. Rachel Dines gives an excellent run down of this cloud-based backup solution in her blog on the NetApp communities. Additionally, NetApp A-Team member Jarett Kulm gives a run down from a non-NetApp perspective in his blog. Backups and restores are forever evolving and NetApp AltaVault is helping you get to the next step. TECH::NetApp at OpenStack Summit 2015 – Where do I find session recordings? OpenStack Summit 2015 in Vancouver came and went last week and NetApp’s OpenStack team was well represented. That’s fitting, as NetApp is one of the key contributors to the OpenStack standard as a Gold member. If you’re interested in the NetApp Github repository, check it out here. If you have any questions, feel free to comment or tweet @NFSDudeAbides! Looking for OpenStack on NetApp Technical reports? What the heck is an LDAP anyway? This post will focus on Distinguished Names (DN) in LDAP. Contrary to how it sounds, these attributes are not fancy by any stretch of the imagination. In fact, they can be downright messy, depending on how the LDAP objects are laid out. Distinguished Names are the full paths to objects in LDAP. They are comprised of a number of Relative Distinguished Names (RDNs). RDNs are components of the Distinguished Name. 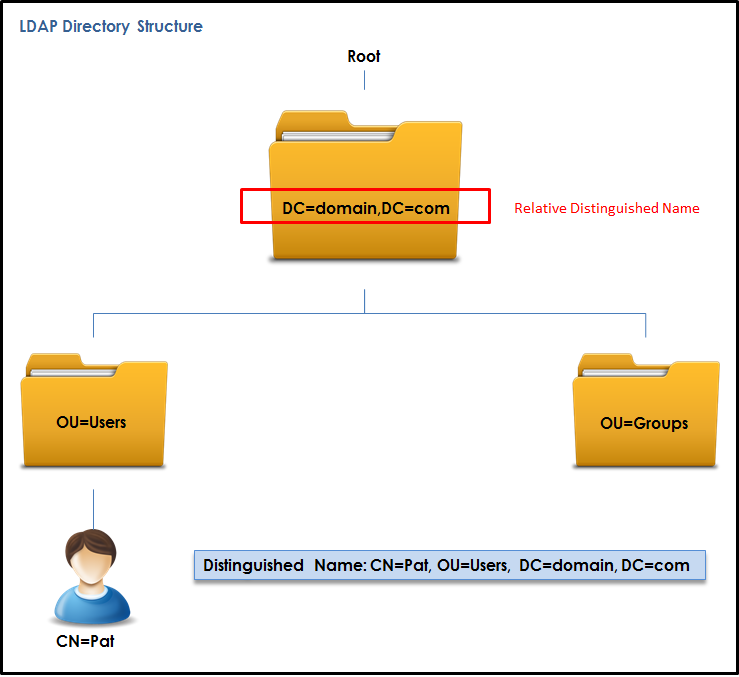 In the diagram below, “DC=domain,DC=com” is a Relative DN to the DN of CN=Pat, OU=Users, DC=domain, DC=com. How do these get messy? To avoid long DNs, you could use a wide folder structure. This is one suggested best practice for designing a LDAP environment, if only to make managing objects easier. In the examples above, we see abbreviations like OU (Organizational Unit), DC (Domain Component) and others. These are simply different types of RDNs. There are a slew of these that are used in various LDAP schemas. The following table (from Microsoft’s MSDN) shows a list of typical RDNs used in LDAP. There are rules to what characters can be used in RDNs. If these characters need to be included in the RDN, they have to be “escaped” with a backslash (\). The following characters are reserved for specific functions, so they require an escape. 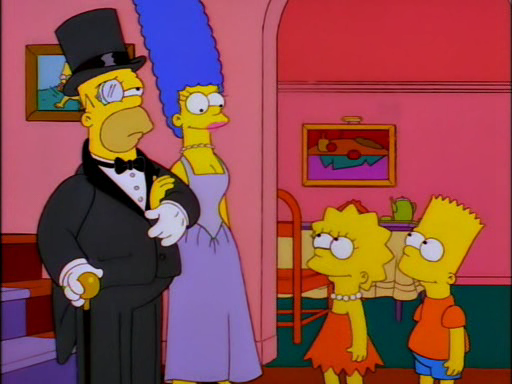 In LDAP, it’s always possible to modify a DN. However, the best way to do that is via the automated tools available from the LDAP server provider. For example, in Active Directory LDAP, we can modify DNs via ADSI Edit. But the better way to do this is via the Active Directory Users and Computers interface. ADSI Edit should only be used when necessary. However, keep in mind that native Windows LDAP management tools are going away in the future, so you may have to resort to a 3rd party management tool. In non-Windows LDAP, DN modification can be done manually via LDIF files, or via the provided GUI interface. As always, check with your vendor for the best ways to do this. For more detailed information on LDAP configuration (particularly with NetApp clustered Data ONTAP), see TR-4073: Secure Unified Authentication. TECH::DevOp(inion) – Are we asking IT and developers to become Skynet? For this purpose, “DevOps” doesn’t differentiate between different sysadmin sub-disciplines – “Ops” is a blanket term for systems engineers, system administrators, operations staff, release engineers, DBAs, network engineers, security professionals, and various other subdisciplines and job titles. “Dev” is used as shorthand for developers in particular, but really in practice it is even wider and means “all the people involved in developing the product,” which can include Product, QA, and other kinds of disciplines. What really resonated with me, however, and what confirmed what I was already thinking about DevOps, was the job description. I’ll post it here (with names/company redacted), but the way it read to me was something that could be summarized in one two word sentence: Be omniscient. If you’re familiar with any/all of the above technologies, you’d know that’s a REALLY long and complicated list and that many of the skills it takes to be proficient at just one or two of those don’t always translate to the others. As a former systems administrator, I can tell you that not all admins know how to code/script – the scripts I’ve made were rarely, if ever from scratch. Rather, they were grabbed from other scripts and cobbled together. It’s rare (if not impossible) to find a solid Windows administrator who *also* can be a solid Linux administrator. 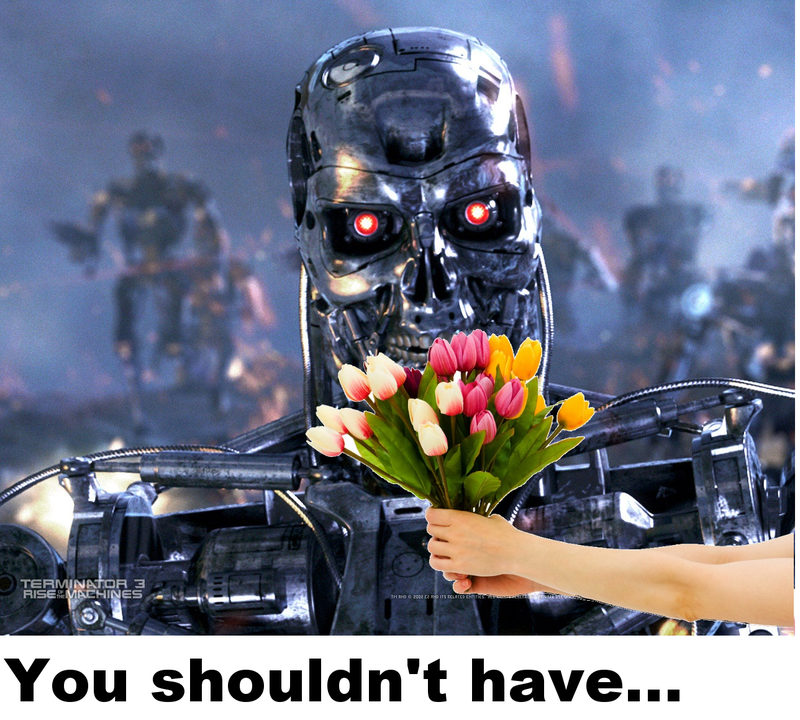 Toss in VDI, Active Directory, Citrix, SAS Analytics and sprinkle in the need to know how to code, and you are virtually asking for a T-800 IT admin, but one that’s a friendly and collaborative people person. It’s a startup mentality inside of established enterprise IT organizations. However, startups do this out of necessity and lack of resources. DevOps has become a movement to tell developers to row harder, and that’s unfortunate. I’m not alone in this thinking. This blog post sums it up from a developer’s point of view. How DevOps should be implemented, in an ideal world, is not by hiring one person to do the job of 5 people. It should be hiring 5 people to collaborate to do the job of 5 people. That way, the overall concept of DevOps remains intact and you don’t need 1 person who’s Skynet – you just need 5 good developers with skill sets that overlap to cover gaps. DevOps should not be a way to reduce headcount, nor a way to squeeze more out of your developers. It should be organic and well-planned. If anything, a DevOps engineer should be someone who comes up with the right way to implement DevOps in an organization. Do you have an opinion on DevOps? Am I way off base (fully admit I could be)? Comment and let me know, or tweet @NFSDudeAbides! Well, the first answer to that question is a question: What is a file lock? 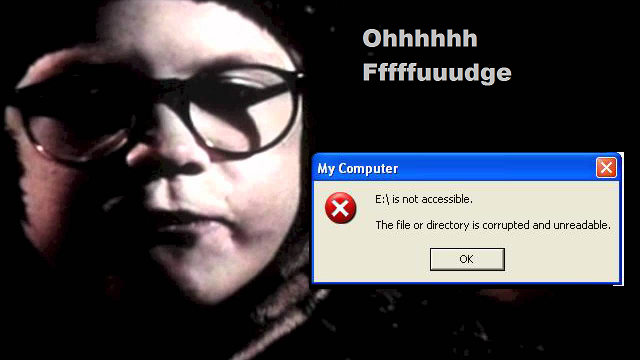 Essentially, a file lock is exactly what it sounds like. We all know what locks are; we have them on our doors. They keep unwanted people and things out. A file lock is no different; it’s a way to prevent unwanted people and applications from accessing files while they are in use to prevent the “c” word – CORRUPTION! File locks are always issued by the requesting client or application – a NAS will only honor or deny the lock. If the client or application does not issue a lock to the file, all bets are off. This is similar to our door locking analogy – a door will not lock unless you turn the key. Similarly, a lock will only be safely broken or released when the application or client is done with it. If the client or application dies, the lock needs to be cleaned up. Depending on the NAS protocol/protocol version, this may or may not require manual intervention. For example, if NFSv3 locks are left over by an application crash (such as an Oracle database), then the locks must be manually cleared on the server before the application can be restarted to use the same files. This is because locking in NFSv3 is handled via the Network Lock Manager (NLM), which is an ancillary protocol to NFS and doesn’t always play well with others. Conversely, NFSv4.x locking is integrated with the protocol and is lease-based. With leases, the locks will live for a pre-determined amount of time. If the client doesn’t renew the lock in that amount of time, the locks will expire. If the client or application crashes, the locks will release on their own after the lease period expires. If the NFS server restarts, the locks will remain intact until either a client reclaims them or the lease expires. A server grants a client a single lease for all state. Simple enough. But what many people don’t know is that there are also different types of file locks. Special thanks to NetApp CIFS/SMB TME Marc Waldrop (@CIFSorSMB on Twitter) for the CIFS/SMB file lock sanity check. Locks in CIFS/SMB are done either at a share level or a file level. A share lock will dictate what level of access is allowed to the open file while the original opener of the file has the file opened. The share level lock, commonly known as share access mode, will dictate whether additional openers of the file can read or write to the file. The share access mode can lock the entire file from additional clients doing specific read or write operations. A file level lock is what most know as byte-range lock. File locking in CIFS/SMB is done via oplocks and share locks. When a file is opened for editing, an oplock is applied and the share-level lock is modified to control what access a client or application has to the file. In some cases, classic byte-range locks are used when portions of a file need to be locked. Created for batch files to help performance issues with files that are opened and closed many times. Used when an application opens a file in “shared” mode; for example, Microsoft Office. Exclusive locks allow a client to assume they are the only ones using a file and will cache all changes locally. This is where that weird looking ~FILE.doc comes from in Word. If another application requests an exclusive lock on the file, the server will invalidate the original lock and the application will flush the cached changes to the file. These get issued when multiple clients want to access the same file. When an application gets issued a Level 2 Oplock, multiple clients can read/cache reads of a file. If any client attempts a write, that client gets issued an exclusive lock. Shared locks can be used by multiple processes at the same time and can only be issued if there are no exclusive locks on a file. These are intended for read-only work, but can be used for writes (such as with a database). This is similar to the Level 2 Oplock in CIFS/SMB. These operate the same as exclusive locks in CIFS/SMB – only one process can use the file when there is an exclusive lock. If any other processes have locked the file, an exclusive lock cannot be issued, unless that process was “forked.” However, unlike CIFS/SMB, there isn’t a notion of “opportunistic” locking, where a file will allow access without outside intervention. Think of a lockable object as a blackboard (lockable) in a class room containing a teacher (writer) and many students (readers). locked, shared locks cannot be obtained. students => If an object is exclusively locked, other exclusive locks cannot be obtained. 1. They all can read what is on it, together => Multiple shared locks can co-exist. shared locks already exist, exclusive locks cannot be obtained. NFSv4.x and later realized this folly and have integrated locking into the protocol. Locking is better now in NFS, and applications are starting to adopt NFSv4.x as a standard because of the improved locking mechanisms. Multiprotocol in NAS simply means “ability to access the same datasets from multiple protocols.” Thus, CIFS/SMB and NFS can read and write to the same files. NFS, especially NFSv3, uses mode bit permissions (such as 777, 755, etc). NFSv4.x implements ACLs, which look and feel an awful lot like Windows NTFS ACLs. They’re so close, in fact, that it solves a lot of the old permissioning issues you would see in multiprotocol environments. But they don’t solve all of our problems. Windows users and groups use a super long Security Identifier (SID) for unique identifiers, which is constructed by leveraging the domain SID and unique user/group Relative ID (RID). 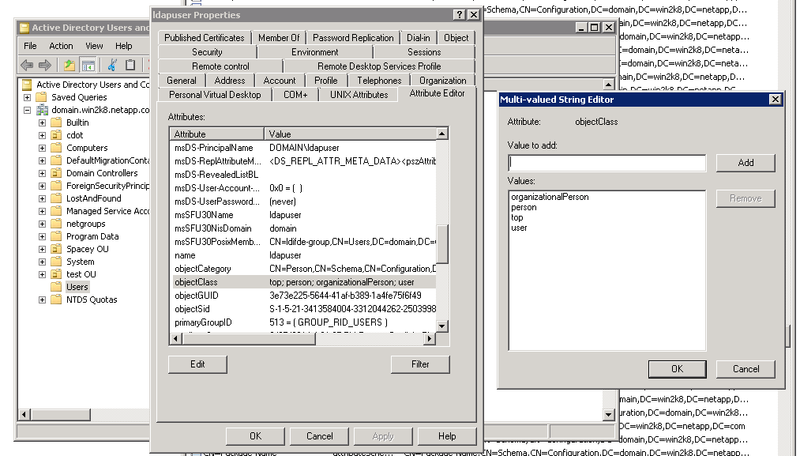 NFS users and groups use a numeric UID/GID and/or NFSv4 ID domain string. In order to get a user to leverage the correct security permission structure, a name mapping has to take place, depending on the originating request + the type of ACL on the file or folder. Unified name services, such as LDAP, are often useful in alleviating the pain of this scenario. As described above. Because of this, the underlying file system has to be able to negotiate the file locking. As it so happens, NetApp invented integrated locking in the 1990s. So, how do NAS vendors (like NetApp) get this to work? In ONTAP (and, by proxy, WAFL), the file system owns the locks and gets the final say as to who gets what access. When a CIFS/SMB client grants an exclusive lock to a file, a NFS client that tries to get a file lock to that same file would not be granted access until the lock has been released. The same goes for NFS clients that have an exclusive lock on a file – CIFS/SMB can’t do anything with that file until the locks is broken/released. These locks are only released when the original client releases them, either voluntarily or by lease expiration. The general idea here is, protocols don’t matter – protect the files at all cost. If I buy a deadbolt lock, I should be able to use it on any door I choose and it should keep my house safe. In ONTAP, you can check to see if a file has a lock via the command line or API calls. cluster::> vserver locks show ? Open a file in a CIFS/SMB share with notepad in Windows. Go to the NFS client. Open the file with vi. Wonder why the heck writes are allowed on both. Bang head repeatedly on desk. 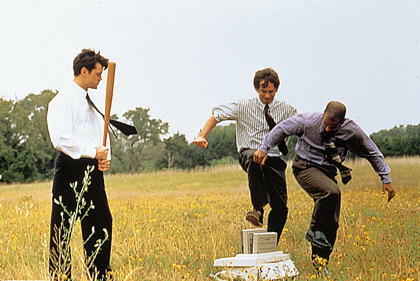 Destroy a copier. The reason why writes are allowed on both clients in this scenario is because NEITHER APPLICATION HAS ISSUED A LOCK. File locks are the responsibility of the client and/or application, not the server. Vi and notepad don’t lock files! The easiest way to lock a file in Windows? Microsoft Office. With this Office file open, I want to test to see if my NFS client can access/write to the file. When I look at the share with “ls,” I can see that funny ~filename listed. ~ by Bram Moolenaar et al. ~ Become a registered Vim user! But when I try to write, it fails. From my NFS client, I lock one of the files in the share with an exclusive lock. In this case, I use “newfile,” because vi has no idea what to do with an Office doc. The expected behavior here? The file will only allow reads. And I am not disappointed! What happens if I have a stale lock? Warning: Breaking file locks can cause applications to become unsynchronized and may lead to data corruption. 1 entry was acted on. Once that happens, I can issue new locks from other clients, whether they are CIFS/SMB or NFS. Doesn’t matter – multiprotocol locking in ONTAP just works! For more information on NFS in clustered Data ONTAP, see TR-4067: NFS Best Practice and Implementation Guide. For more information on assorted aspects of multiprotocol NAS access in clustered Data ONTAP, see TR-4073: Secure Unified Authentication. Additionally, subscribe to Why is the Internet Broken and follow @NFSDudeAbides on Twitter for more NAS-related information! TECH::Docker + CIFS/SMB? That’s unpossible! Recently, I’ve been playing with Docker quite a bit more, trying to educate myself on what it can and cannot do and where it fits in to NetApp and file services/NAS. I wrote a blog on setting up a PaaS container that can do Firefox over VNC (for Twitter, of all things), as well as one on using NFS in Docker. People have asked me (and I have wondered), what about CIFS/SMB? Now, we could totally do this via the Linux container I created via mount -t cifs or Samba. But I’m talking about Windows-based CIFS/SMB. Recently, Microsoft issued an announcement that it will be integrating Docker into Windows Server and Windows Azure, as well as adding Server container images in Docker hub. In fact, you can find Microsoft containers in GitHub today. But the content is a bit sparse, as far as I could see. This could be due to new-ness, or worse, apathy. Time will tell. Encountered a problem reading the registry. Cannot find registry key SOFTWARE\Microsoft\PowerShell. These shell commands are defined internally. Type `help' to see this list. Type `help name' to find out more about the function `name'. Use `info bash' to find out more about the shell in general. Use `man -k' or `info' to find out more about commands not in this list. A star (*) next to a name means that the command is disabled. The preliminary results of using Docker to connect to CIFS/SMB shares aren’t promising. That isn’t to say it won’t be possible. I still need to install Docker on a Windows server and try that PowerShell container again. Once I do that, I’ll update this blog, so stay tuned! Plus, it’s entirely possible that more containers will pop up as the Microsoft repository grows. However, I do hope this works or is at least in the plans for Microsoft. While it’s cool to connect to a cloud share via CIFS/SMB and Azure, I’d like to be able to have control over connecting to shares on my private storage, such as NetApp. TECH::Using NFS with Docker – Where does it fit in? 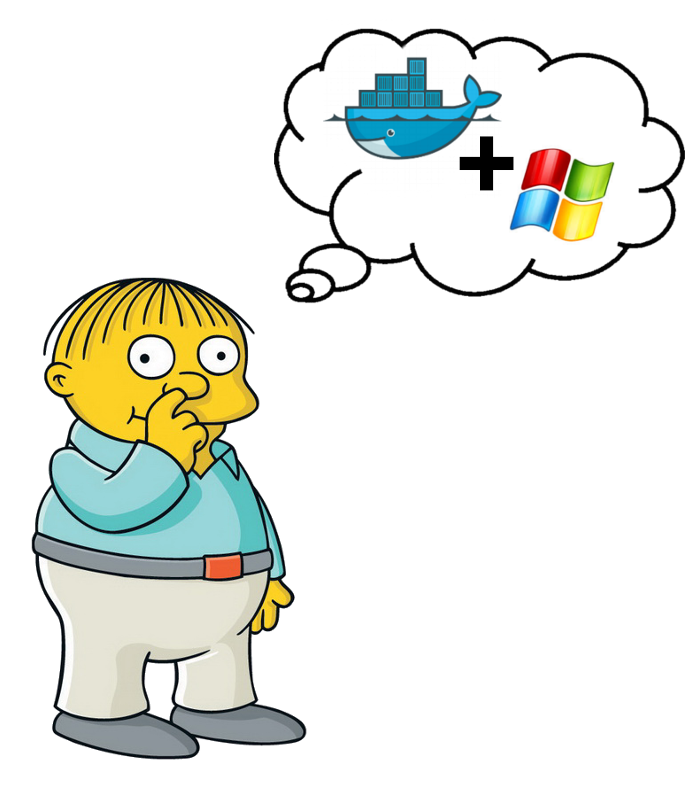 NOTE: I wrote this blog nearly 2 years ago, so a lot has changed since then regarding Docker. Docker + NFS + FlexGroup volumes = Magic! Also, check out how to Kerberize NFS in a container! Recently, I wrote a post on DataCenterDude.com on how to use Docker to create the ultimate subtweet via a container running VNC and Firefox. That got me thinking… as the NFS TME for NetApp, I have to consider where file services fit into newer technologies like Docker. What use cases might there be? Why would we use it? Can I store Docker images on NFS? When you run a build of a Docker image, it gets stored in /var/lib/docker. # restrictive defaults, such as 100GB max storage. We can see that a sparse 100GB file is created in /var/lib/docker/devicemapper/devicemapper, as well as a 2GB metadata file. This seems to be where our images get stored. drwx------. 2 root root 32 May 4 22:59 .
drwx------. 5 root root 50 May 4 22:59 ..
And we can see that there is actually 743MB in use. 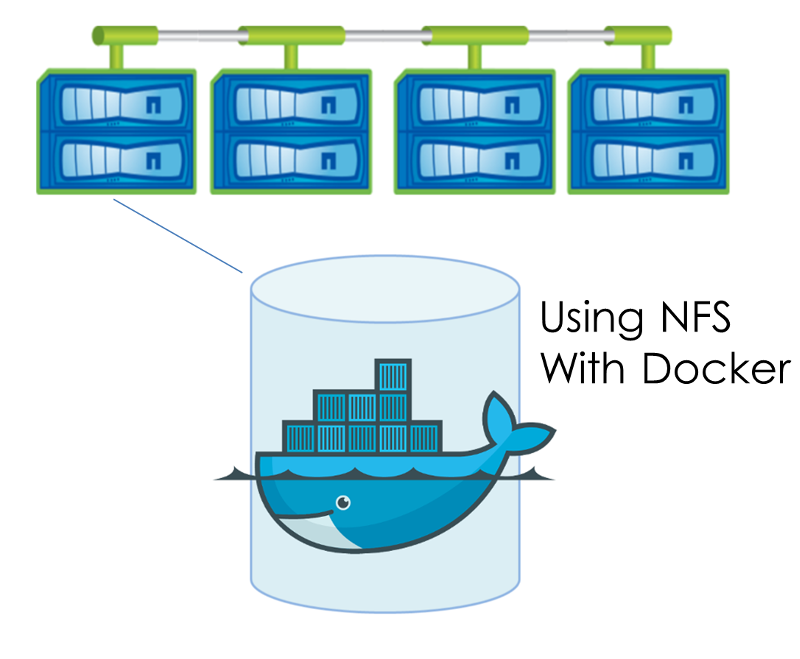 However, you could still use NFS to store the Docker image data and metadata. How? Mount a NFS mount to /var/lib/docker! drwx------ 2 root root 4.0K May 7 21:39 .
drwx------ 4 root root 4.0K May 7 21:39 .. So what could we use NFS for in Docker? When you create a container, you are going to be fairly limited to the amount of space in that container. This is exacerbated when you run multiple containers on the same host. So, to get around that, you could mount a NFS share at the start of the container. With NFS, my storage limits are only what my storage provider dictates. Another benefit of NFS with Docker? Access to a unified set of data across all containers. If you’re using containers to do development, it would make sense that the containers all have access to the same code branches and repositories. What if you had an application that needed access to a shared Oracle database? One thing I’ve noticed while learning Docker is that the container OS is nothing like a virtual machine. These containers are essentially thin clients and are missing some functionality by design. From what I can tell, the goal is to have a client that can run applications but is not too heavyweight (for efficiency) and not terribly powerful in what can be done on the client (for security). For instance, the default for Linux-based OSes seems to leave systemd out of the equation. Additionally, these clients all start in unprivileged mode by default, so root is a bit limited in what it can and cannot do. As a result, doing something as simple as configuring a NFS client can be a challenge. Why not just use the -v option when running your container? My own knowledge – what would it take? I learned a lot about Docker, containers and the Linux OS doing it this way. Cloud – If we’re mounting NFS on a Docker host, what happens if we want to use those images elsewhere in the world? We’d then have to mount the containers to those Docker hosts. Our end users would have to either run a script on the host or would need to know what to mount. I thought it might scale better to have it built in to the image itself and make it into a true “Platform as a Service” setup. Then again, maybe it *would* make more sense to do it via the -v option… I’m sure there could be use cases made for both. In this example, I am going to use NFS running on clustered Data ONTAP 8.3 with a 1TB volume. The NFS server will have NFSv3 and NFSv4.1 (with pNFS) enabled. I’ll need an export policy and rule. For now, I’ll create one that’s wide open and apply it to the volume. The Dockerfile is a configuration file that can be used to build custom Docker images. They are essentially startup scripts. This requires systemd to be functioning properly in your Docker container image. This is no small feat, but is possible. Check out Running systemd within a Docker Container for info on how to do this with RHEL/Fedora/CentOS, or read further in this blog for some of the steps I had to take to get it working. There are containers out there that other people have built that run systemd, but I wanted to learn how to do this on my own and guarantee that I’d get exactly what I wanted from my image. To run just NFSv4, all you need are the nfs-utils. No need to set up systemd. I essentially took the Dockerfile from the systemd post I mentioned, as well as this one for CentOS and modified them a bit (removed the rm -f entries, created directory for mount point, changed location of dbus.service, copied the dbus.service file to the location of the Dockerfile, installed nfs-utils and autofs). From what I can tell, mounting NFS in a Docker container requires privileged access and since there is currently no way to build in privileged mode, we can’t add mount command to the Dockerfile. So I’d need to run the mount command after the image is built. There are ways to run systemd in unprivileged mode, as documented in this other blog. On the client, we could also set up automounter to mount the NFS mounts when we need them, rather than mounting them and leaving them mounted. I cover automounting in NFS (for homedirs)with clustered Data ONTAP a bit in TR-4073 on page 160. Doing this was substantially trickier, as I needed to install/start autofs, which requires privileged mode *and* systemd to be working properly. Plus, I had to do a few other tricky things. # For details of the format look at auto.master(5). # "nosuid" and "nodev" options unless the "suid" and "dev"
# options are explicitly given. # The included files must conform to the format of this file. Here’s my Dockerfile for a container that can run NFSv3 or NFSv4, with manual or automount. The script had to live in the same directory as my Dockerfile. I also had to copy dbus.service to that same directory. # docker build -t parisi/nfs-client . Now I can start systemd for the container in privileged mode. # docker run --privileged -d -v /sys/fs/cgroup:/sys/fs/cgroup:ro parisi/nfs-client sh -c "/usr/lib/systemd/systemd"
Failed to issue method call: Unit rpcidmapd.service failed to load: No such file or directory. May 11 21:03:24 e157ecdf7269 systemd: Started Automounts filesystems on demand. Once the script runs, I can start testing my mounts! drwxrwxrwx 2 root root 4096 May 12 15:14 .
drwxr-xr-x 20 root root 4096 May 12 15:13 ..
10.228.225.142:/docker on /docker-nfs/docker type nfs4 (rw,nosuid,relatime,vers=4.1,rsize=65536,wsize=65536,namlen=255,hard,proto=tcp,port=0,timeo=60,retrans=2,sec=sys,clientaddr=172.17.0.134,local_lock=none,addr=10.228.225.142)   <<<< there it is! Now that I’ve done all that work to create a Docker image, it’s time to share it to the world. Also, check out this fantastic blog post by Andrew Sullivan on using NetApp snapshot technology to make Docker images persistent! This post will focus on the schema portion of LDAP. What is a schema in LDAP? Attribute Syntaxes—Provide information about the kind of information that can be stored in an attribute. Matching Rules—Provide information about how to make comparisons against attribute values. Matching Rule Uses—Indicate which attribute types may be used in conjunction with a particular matching rule. Attribute Types—Define an object identifier (OID) and a set of names that may be used to refer to a given attribute, and associates that attribute with a syntax and set of matching rules. These are defined in detail in RFC-2252. Object Classes—Define named collections of attributes and classify them into sets of required and optional attributes. Name Forms—Define rules for the set of attributes that should be included in the RDN for an entry. Content Rules—Define additional constraints about the object classes and attributes that may be used in conjunction with an entry. Structure Rule—Define rules that govern the kinds of subordinate entries that a given entry may have. When dealing with LDAP schemas, there are a subset of the above that we deal with on a regular basis for name services/identity management. Attribute syntaxes define what type of information can be stored as an attribute. These are defined by an object identifier (OID) and control whether an entry can be in Unicode, integer format or other format. These attribute syntaxes are generally not modifiable. 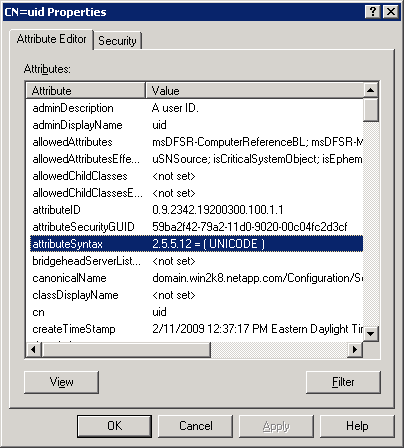 In Active Directory, the objectClass can be modified and viewed via the Active Directory Users and Computers in advanced view via the Attribute Editor tab. In general, we could think of objectClasses like we’d think of how we use a phone book’s Yellow Pages. We don’t look for things in the Yellow Pages by name, but rather by type of business. If we wanted to find a grocery store, we’d use an objectClass of “groceryStore” to filter our results to speed up our search. The most relevant and necessary parts of a LDAP server’s schema (at least when it comes to client configuration) are the attributes themselves. These are the specific entries in the LDAP schema that define who and what the object is, specifically. If we extend our Yellow Pages analogy, after we find the objectClass=groceryStore, these would be the phone number, address, etc. of the grocery store. That information happens to be the most critical portion of the object, as they tell us what we need to know about the object we were looking for. In a LDAP server used for name services/identity management, the attributes will tell us information about users, groups, hosts, netgroups, etc. such as phone numbers, email addresses, physical location, IP addresses, UID/GID for UNIX based permissions, SIDs for Windows environments and many, many more. Attributes are broken down into two categories: the attribute and the value. These attributes are defined in schema templates of clients and should be compliant with RFC-2307 standards for a valid LDAP server configuration. Common LDAP servers such as Microsoft Active Directory, OpenLDAP, Sun Directory Server, RedHat Directory Server (and IdM), Apple Open Directory, Oracle Internet Directory, Vintela… these all fall under the RFC standards. For a list of LDAP software available, see this Wiki entry. This is the portion of the attribute that populates the information we want to be used in queries. For example, if I have an attribute of uid, I can populate the value with the list of UNIX names I want to use in queries. When a LDAP search is issued, the attribute and value are passed. In the above, both objectClass and sAMAccountName are attributes. User and ldapuser are values. How do I change them? Attribute values are editable in most cases, but in some cases, the LDAP schema might have set the value to “read only.” This is fairly common in Active Directory as a means of idiot-proofing/CYA. But there often are ways to modify the schemas to allow editing of these attributes, if desired. Always do this with caution, and ideally, in a lab first and with the guidance of your LDAP server vendor. Attributes themselves are also editable. We can also create custom attributes in LDAP if we choose. 3rd party LDAP products like Vintela do this for you. But in most cases, it’s best to leave the default schemas alone, and instead, modify the clients to query the attributes we have populated. 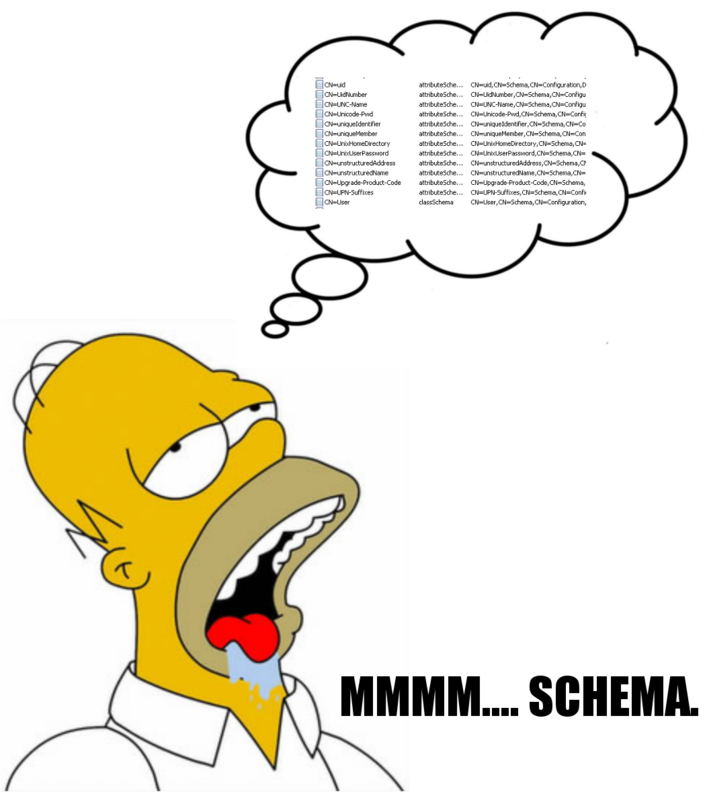 Many clients have default schema templates, including NetApp’s clustered Data ONTAP. By default, Microsoft Active Directory do not contain the UNIX attributes needed to use the server as a UNIX Identity Management server. The schema had to be extended to create the necessary attributes types to allow for proper UNIX-based authentication. Extending the schema in domains with multiple domain controllers is non-disruptive; only one server needs to have the schema extended and then it can replicate to the other servers. For information on extending schemas or enabling identity management, see the TechNet article on IDMU. UNIX-based LDAP servers such as OpenLDAP don’t have to do this, as they are intended for use with UNIX authentication by default. One of the reasons I like Microsoft’s Active Directory so much for UNIX identity management (aside from the integration of services and pre-existence in enterprise environments) is the built-in schema replication. Want to create a new LDAP server? Cool. Add it to the domain. You’re done. 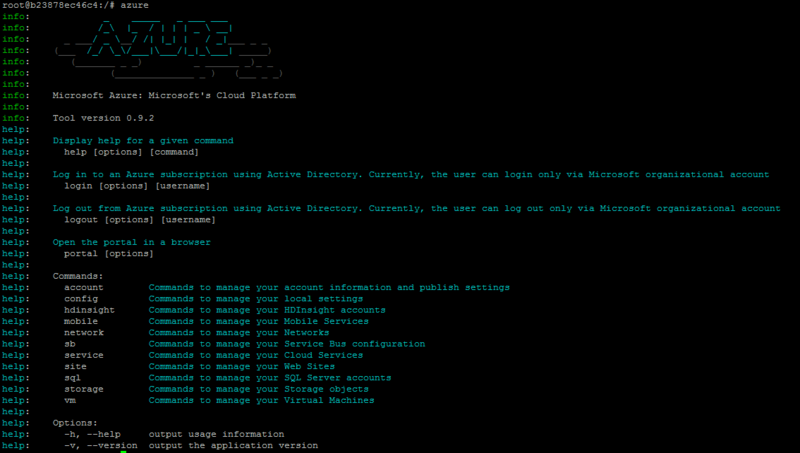 Microsoft Active Directory replicates every 15 minutes by default. That means all schemas, attributes, etc. get copied over to all domain controllers in a domain. In a forest with multiple domains, it’s possible to replicate UNIX attributes across those domains to allow cross-domain UNIX authentication. So if your company acquires another company, you can simply add their domain to your forest and enable replication of their UNIX attributes and keep using your existing set up. I describe how to do this in TR-4073 on page 103. LDAP schemas are the lifeblood of directory services, so it’s important to understand them as best as possible. Hopefully this post has helped clear some things up. 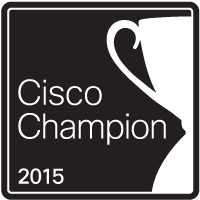 As a Cisco Champion, we are asked to write a blog for the Cisco blogs. As a NetApp employee, I decided to merge the worlds and talk a bit about flow control and clustered Data ONTAP.